Rust College is a private, four-year, coed college, founded in 1866 by the Freedman’s Aid Society …. 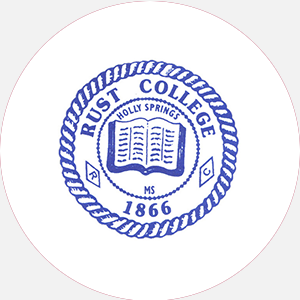 Rust College is a private, four-year, coed college, founded in 1866 by the Freedman’s Aid Society of the Methodist Episcopal Church. It is the oldest historically black college in Mississippi. Rust began as Shaw School and was chartered in 1870 as Shaw University, in honor of Reverend S. O. Shaw. It originally provided elementary education; later, high school and college courses were added. In 1878, the College graduated its first 2 students. Shaw University became Rust University in 1892 to eliminate confusion with another school of the same name. In 1915, the name Rust College was adopted to more accurately reflect the scope of programs. The elementary and secondary programs were discontinued in 1930 and 1953, respectively. As a private, church-related school, Rust College works to heighten each student’s moral, spiritual, intellectual, and social growth. Rust’s first president, Reverend A. C. McDonald, created the school’s motto By their fruits ye shall know them. More than thirty buildings grace the rural 120-acre campus, including the original 1867 building, Oakview Mansion, which is now a dormitory for women. The Leontyne Price Library, named for the Metropolitan Opera star, was one of eight major building projects completed between 1967 and 1974. An aggressive construction program has continued into the 1990s, with the Ervin Magic Johnson Sports Arena completed in 1992. Rust is accredited by the Southern Association of Colleges and Schools to award the Bachelor of Arts, Bachelor of Science, and Associate in Science degrees. Percentage of students receiving financial aid: 98 Financial Aid Specific to the School The Army ROTC program offers two-, three-, and four-year scholarships that pay tuition, books, fees, other expenses and a monthly stipend. May 1 (fall); August 15 (spring). Rolling admissions; August 15 (preferred); January (Spring); April (Summer). Graduation from an accredited high school (or equivalent) and completion of the following 16 units: 4 English, 3 social studies, 3 mathematics, 2 natural sciences, and 4 electives. Two letters of recommendation are required, with one from the school principal or counselor. A medical exam is required. A nonrefundable application fee is required. Admission Application Deadline: Rolling admissions; August 15 (preferred); January (Spring); April (Summer). Admission Contact: Director of Admissions, Rust College, Holly Springs, Mississippi 38635; Telephone: 662-252-8000 Ext. 4065; 888-886-8492 (toll-free); 662-252-8895 (fax). Bachelor\’s: 124 semester hours, including core requirements, with a 2.0 minimum GPA; must be a full-time student for at least two semesters; last 30 semester hours must be completed at Rust College, including one third of the courses in the major area of study. Associate: 63 semester hours, including core requirements, with a 2.0 minimum GPA; must be a full-time student for at least one semester; last 15 semester hours must be completed at Rust College. Campus Regulations: All students are encouraged to live on campus. Exceptions are made for married students and local students within commuting distance. Campus Services: Health center, guidance and counseling, student employment, career placement, testing, remedial assistance, and religious services (including chapel). Campus Activities: Social and group activities include theater, band, chorale, and dance. Cultural activities on and off campus include music, book reviews, plays, and lectures. Assembly programs offer entertainment and spiritual enrichment. Students may get involved with the student newspaper, the Rustorian, or join the Bearcat yearbook staff. Communication majors may work in the campus radio station (WURC-FM) or the television station (RC-TV2). Leadership opportunities can be found in the Student Government Association, the NAACP, the International Students Association, the Honors Council and many other student groups. Greek sororities include Alpha Kappa Alpha, Delta Sigma Theta, Sigma Gamma Rho, and Zeta Phi Beta; fraternities include Alpha Phi Alpha, Kappa Alpha Psi, Omega Psi Phi and Phi Beta Sigma. Four honor societies are also represented on campus. Housing Availability: 856 housing spaces; five dormitories. All students are encouraged to live on campus. Exceptions are made for married students and students within commuting distance. August-April 25 (semesters) Commencement and conferring of degrees: April One summer session.